The footprints of past travellers have marked out a network of scenic trails that attract trampers from around the world. Many of these pathways were once important routes for Māori transporting greenstone, for gold miners and for deer cullers. Māori made New Zealand’s first walking tracks as they travelled around the country. Often they walked along the beach, but they also cut tracks through the forest, and used ladders or pegs to climb steep cliffs. In the South Island they made trails up the valleys and across the mountains to the West Coast, the only place that had precious pounamu (greenstone). The first European explorers were often guided by Māori along traditional tracks. Later, settlers began to build roads and railways, but many still travelled on foot, especially in the rough back-country. Gold miners headed into the South Island’s mountains, carrying packs. Shepherds moved sheep and cattle along farm tracks. Loggers carried out timber on forest trails. Deer cullers used mountain tracks and huts when clearing the forest of deer. To mark the path and avoid getting lost, trail makers chipped the bark off trees, or built cairns (piles of stones) – this is known as blazing a trail. Today, orange plastic markers are often used. It took some time before people enjoyed exploring New Zealand’s native forests and other places of wild, natural beauty. At first, they followed the old tracks made by Māori and gold miners. In 1880 an explorer, Donald Sutherland, discovered the spectacular Sutherland Falls near Milford Sound in Fiordland. 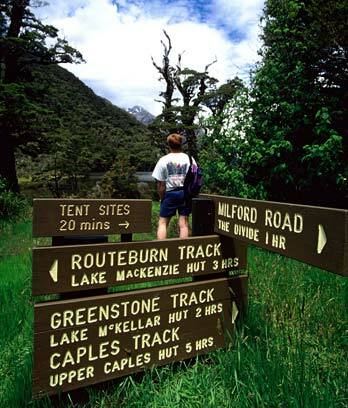 The Milford Track was made, and tourists walked along the route, staying in huts. The track was called ‘the finest walk in the world’. Soon, more walking trails and huts were made, especially in national parks such as Taranaki, Tongariro and Abel Tasman. On Mt Ruapehu, hikers stayed at the Chateau Tongariro hotel, built in 1929. By the 1970s physical fitness was very popular, and the government started a network of walkways, marked with an orange ‘W’. Some follow old gold-mining or railway trails. In 2007 there were 125 walkways.